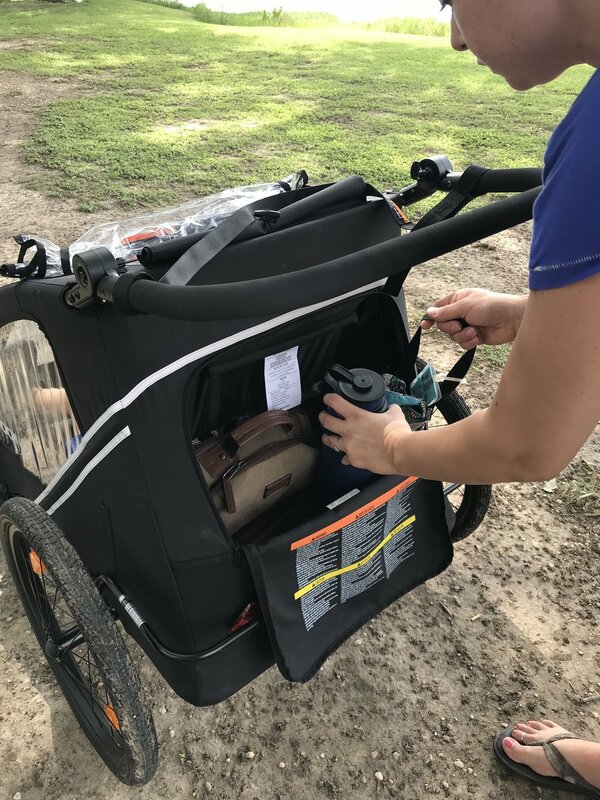 In the past, our family’s stroller ownership consisted of a little umbrella stroller that didn’t get used very often because it’s wheels easily stuck on the Texas Hill Country rock’s that litter our entire Homestead’s landscape. If you and your baby have ever used an umbrella stroller you know it’s primary function is sun protection and simplicity. Fast forward a few years and the stroller strategy has evolved tremendously. From double strollers, car seats and jogging strollers the options and customization have become compatible with ease and simplicity. 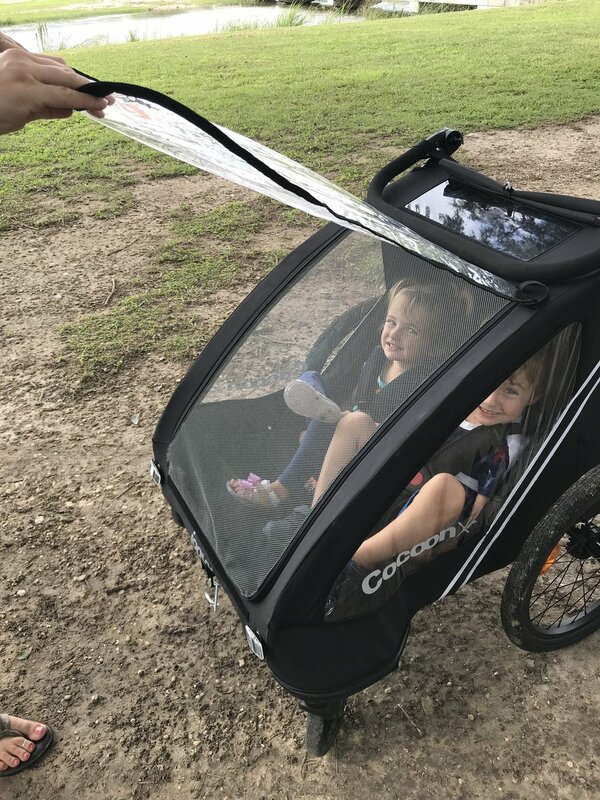 Modern stroller manufacturers like Joovy are innovating parenting equipment and designing features with convenience and parents in mind..
We recently had the opportunity to try out the Joovy Cocoon x2. It is a bike trailer and also converts nicely into an all-terrain jogging stroller. 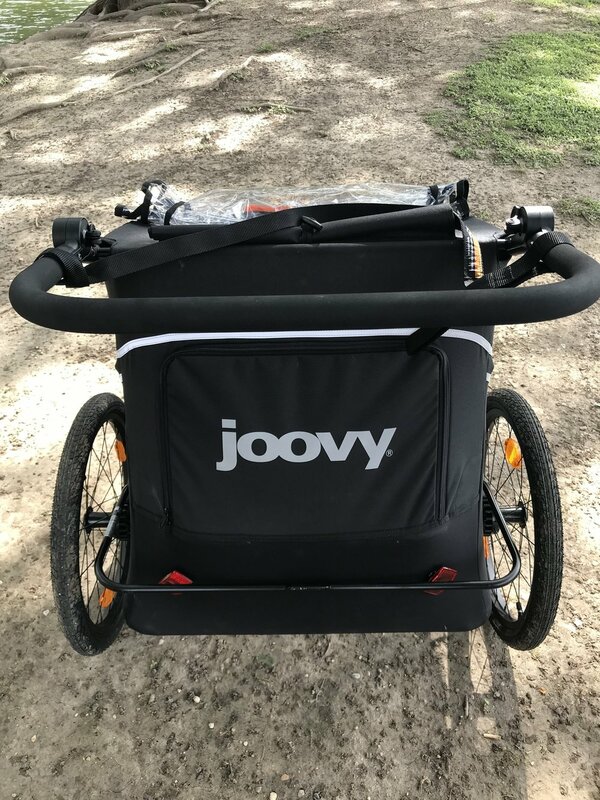 From the structural designs to the customized options, you can tell Joovy is listening to the parents and their needs when designing their strollers. In fact, if you follow along on any of their social media platforms you will see that they are all about modern parenting and convenience! We received one for free to try out and give our honest opinion but of course, you can expect the truth and nothing but. 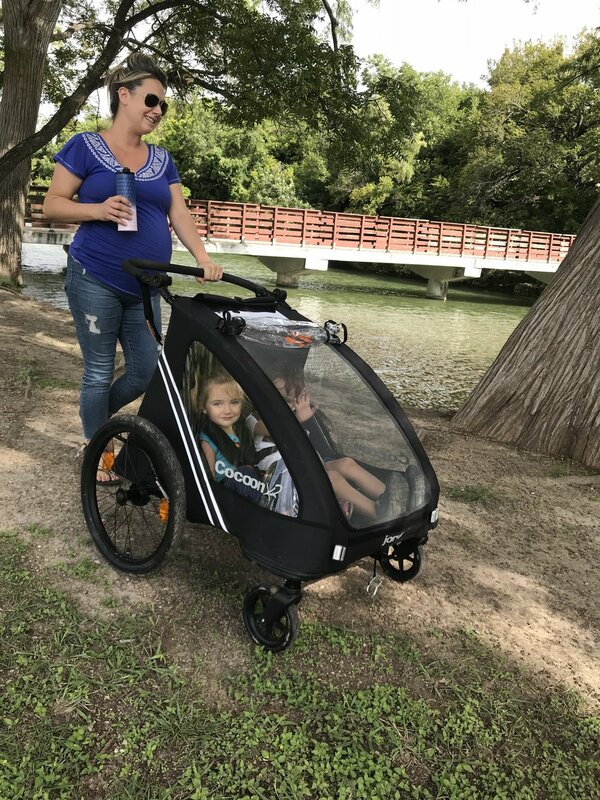 This trailer turned stroller fit our lifestyle perfectly and has turned me into a stroller-toting outdoors mom. For the kids, their favorite feature is the cabin of the stroller. The leg room is spacious enough for two large children and is designed for children six months and up. 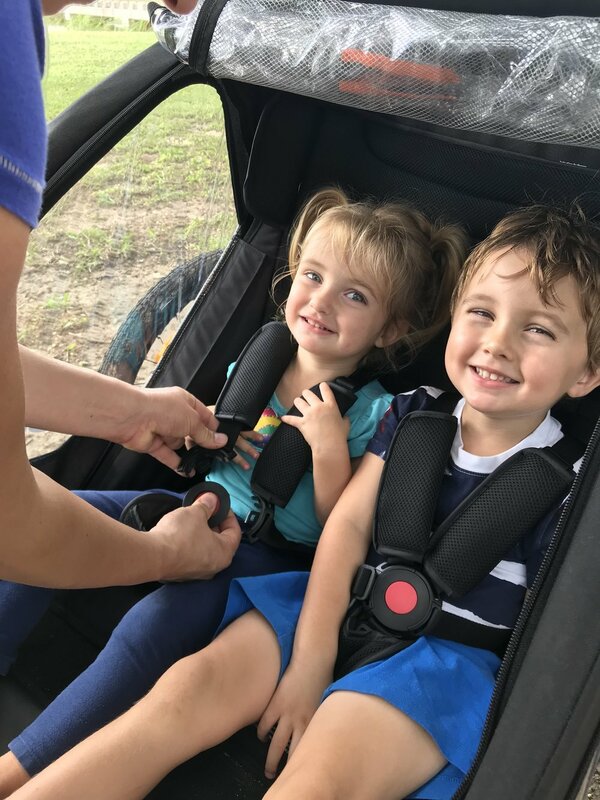 The seating includes two five-point harnesses for safety and bicycle helmets should be worn when using it as a bike trailer. It was very easy and comfortable for the kids to sit in together and they were able to stretch out their legs, relax and enjoy the ride! The stroller itself looks clean and modern like a travel pod. 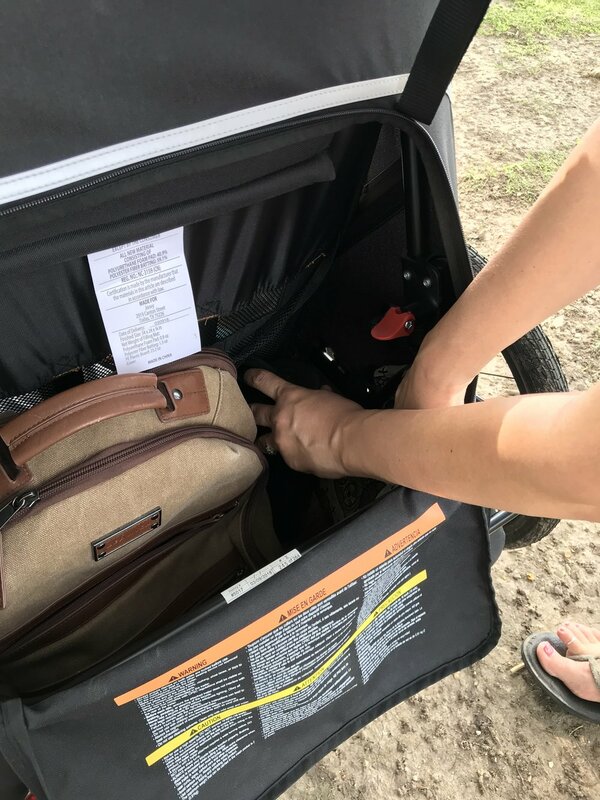 In addition to the spacious sitting room, this stroller includes tons of rear zipper storage for backpacks, snacks, water bottles, helmets and anything else you can throw in. The amount of storage space is astounding and perfect for families on the go. Packing for a hike, bike or long walk requires planning and packing and this Cocoon X2 is ready to haul the load. When we venture away from the house, down to the river valley or up the paved road, heat, wind or an isolated storm are always possible. We have been on a long walk more than a few times and got caught in a random downpour. I don’t mind the outdoor shower so much but the kids definitely prefer an umbrella or shelter if possible. 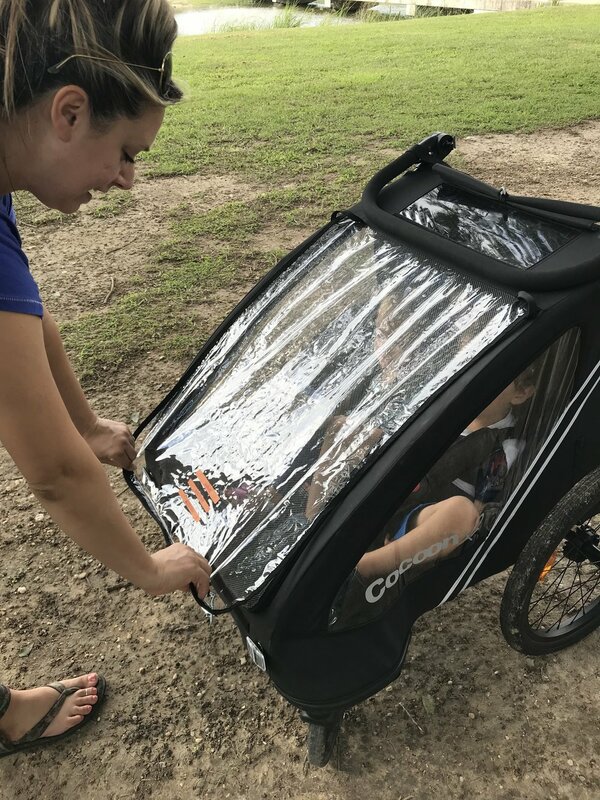 The Cocoon X2 has two cabin options; a mesh zipper cover to allow air and wind to flow freely for a cool breezy ride and a zipper rain guard for moist weather runs and hikes. Before the Cocoon X2, I did not have a go-to stroller. 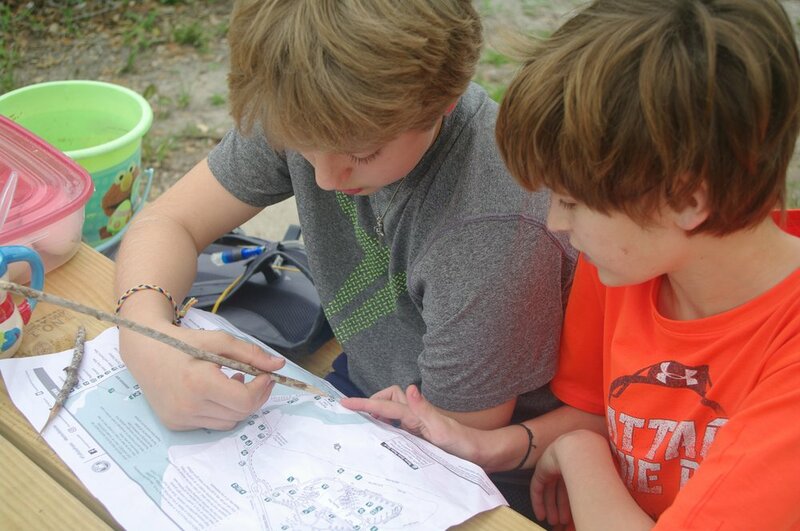 We used hiking backpacks for big trips and let the kids do their own walking for the most part. 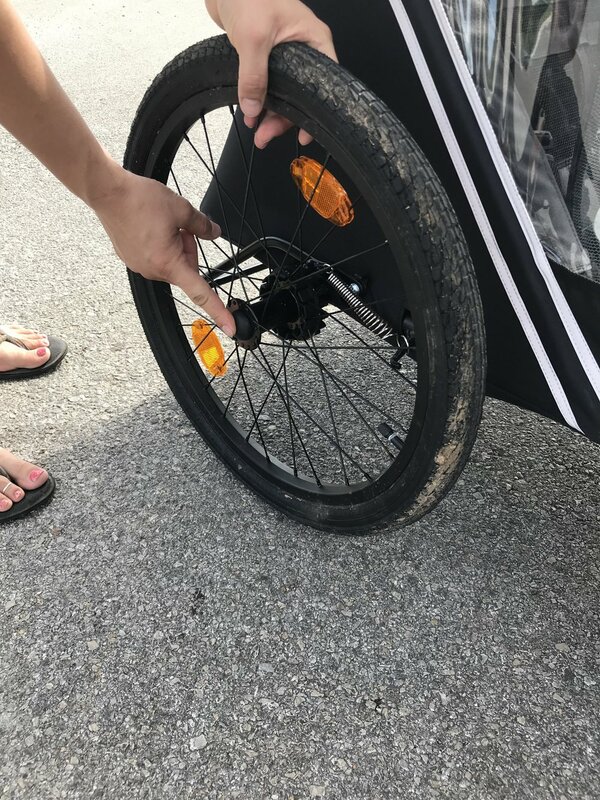 One reason for not using strollers more frequently is manageability in rough terrain; gravel roads, river valley rock bottoms, steep inclines, and dense forest maneuverability. 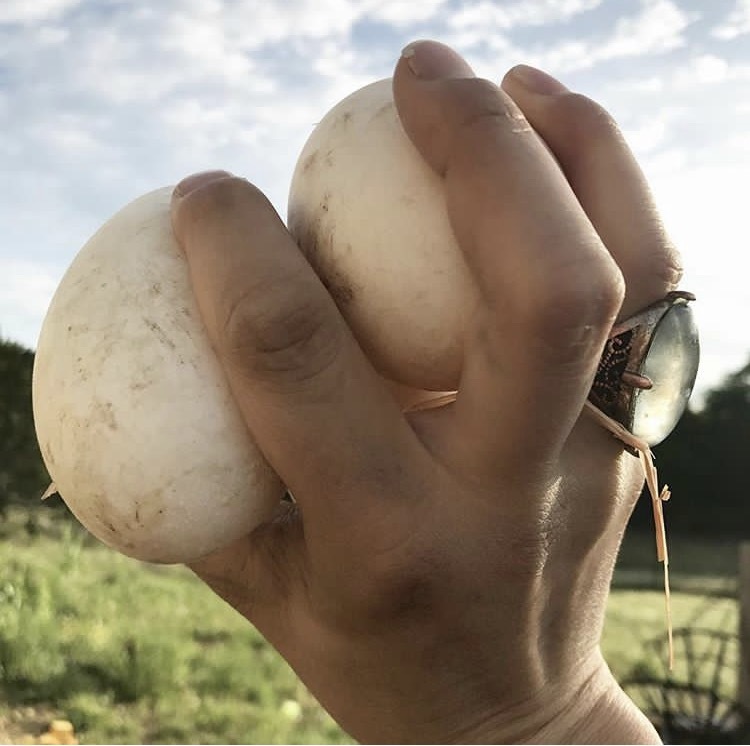 The wheels on the Cocoon X2 change these factors. The wheels are large and all-terrain ready. They also detach easily with a touch of a button in preparation for storage and travel. 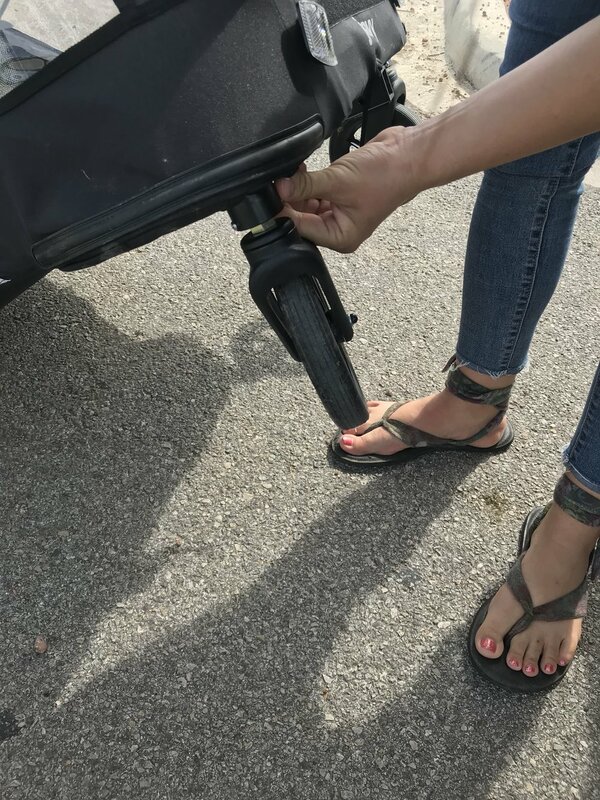 Extra special features include; an easy foot-activated parking break bar, an adjustable handlebar for walking and height preference and a tow bar and biking flag are included to switch the unit into bike trailer mode! The entire unit is collapse-able which is rare for a bike trailer and I am in awe of. 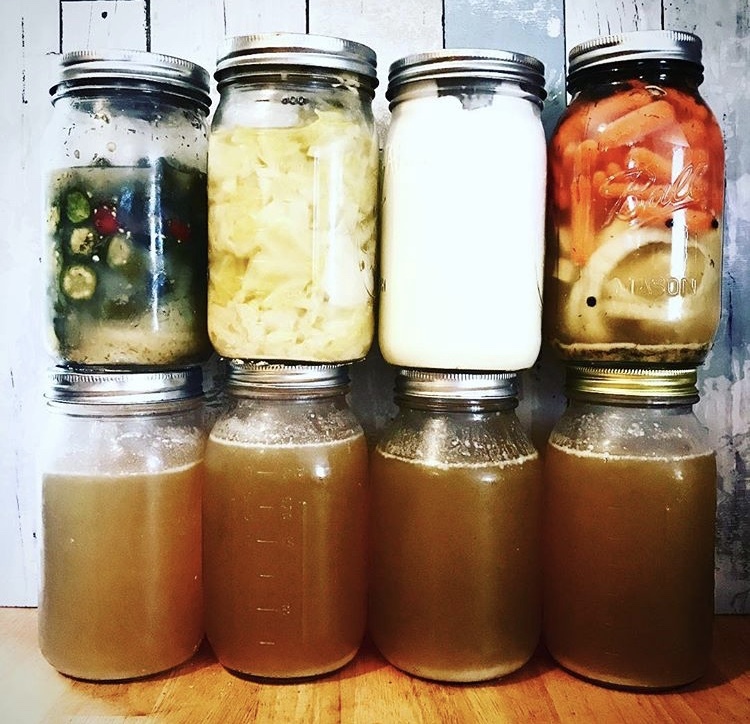 It’s so easy to break this thing down, throw it in the car and go places! And going places is definitely something we will be doing with the new Joovy Cocoon X2!